I have been listening to Ann Licater's music now since I first received Following the Call which came out in 2007 and I must say that I have never been disappointed in any of the music that she has recorded over the years. Beyond the Waves is Ann’s 4th album to date and comes a little more than 2 and ½ years after the release of Invitation From Within. While I value diversity and surprises in my music I have also come to expect a certain amount of stability and constancy in the music that I listen to as well. When I pick up an Ann Licater album I know there will be new songs and music that will explore different aspects of her talent and personality but I also know that I can expect that those songs will meet my expectations given my past experiences with her music. 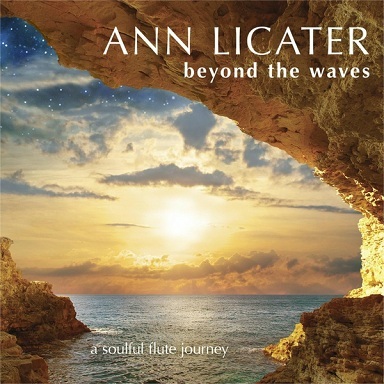 Beyond the Waves does not disappoint me in regards to either point and I’m sure that you will find the 12 compositions that comprise Beyond the Waves to be a melodic journey with Ann showing us the way forward with a variety of flutes that she demonstrates her mastery of song after song. One of my favorite tracks on this album is a song called Sailing on Moonlight. I think that what drew me to this song is the definite jazz feel of the song itself and the interplay between Ann’s flute, the keyboards and the bass. While retaining Ann’s signature flute playing as the focal point of the song the other instruments offered a sensuous soundscape on which Ann skillfully sculpted and painted a wonderful composition filled with emotions and a very enjoyable jazzy kind of vibe. You could almost see this song being played late night in a club with a trio onstage and a very appreciative audience looking on and taking it all in. Running at 6:26 this song had more than ample time to draw the listener in and let them get comfortable with the atmosphere that was woven about them. Another striking song is one called Song of the Willows which features Ann playing flute and wind chimes acting as her sole accompaniment. This song is a powerful and haunting piece of music that is at once soul-stirring and gentle as a whisper in its impact on the listener. It is also a spotlight shining brightly on Ann’s considerable talent in making her flute “speak” as the composition seems to bubble up from her soul and pour out of her instrument straight into the heart of the listener. The song begins with the sound of wind chimes that immediately creates a peaceful and serene vision in most people’s minds so that the listener’s heart is primed when she begins to converse to them with her flute. The music is inspiring from the very first note and allows Ann to musically explore her inner visions of this wonderful sound world that she created for this composition. The two songs talked about above are by no means the only ones that impressed me but I don’t normally review an album track by track. Suffice it to say that the level of production on this album is quite impressive and that Ann is a very talented flautist who has created with Beyond the Waves a place where many will find songs that will act as guides into many meditative landscapes. Ann has also gathered around her some very talented individuals who compliment the work that she does on flute and understand the subtly of her compositions so that they work together with Ann in bringing forth a collection of songs that speak with one voice. The listener will finish this album in a comfortable and contented state of mind having had the stresses of the day driven completely out of them by the time that the last track on this album has played. It is apparent that Ann Licater is deeply passionate about her music and that her playing was nothing less than heartfelt at all times. I will leave it to the listener to make any final calls about what the music evokes in them but as for AV I would say that Ann’s latest album is definitely worth picking up.